Uptown is jazz. My grandfather says, "Jazz and Harlem are a perfect match - just like chicken and waffles." What a beautiful love song to Harlem. Collier shows his young audiences that Harlem isn't just a cultural treasure for New York City and for our country, but it's also a happening place to live. I had the privilege of hearing Collier read this book aloud recently when he visited the Ann Arbor District Library for Martin Luther King, Jr. Day and immediately knew I needed to own it. I was sad that Literati Bookstore, who was selling some of Collier's books at the event, didn't have this one for sale because Collier's spirited, rhythmical telling of all the things he loves about his neighborhood perfectly evokes the spirit of Harlem. I would have loved to get this one signed. 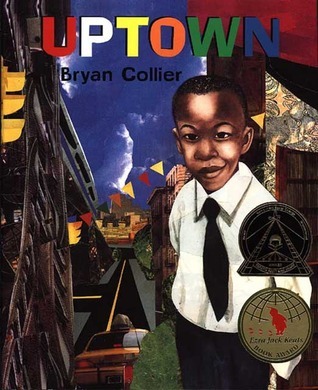 Uptown a great book to pair with Harlem: A Poem by Walter Dean and Christopher Myers, as well as the poetry of Langston Hughes. I am fascinated with Harlem - the history, the great art, literature, and music. And this book is a great entry point to start discussing with kids what is so special about it. And of course, the reason I picked the quote from the book at the beginning of this review is because, well, Harlem is the first place I ever had chicken and waffles last summer and it has been a beautiful friendship ever since.